When we discover who we are in relation to each other, we think differently, act differently, and treat other people differently. That is the key message of the video “Connect. 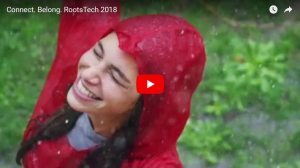 Belong” that was shown at the opening of the RootsTech 2018 conference. Humans are born with an inherent need for connection and belonging. We are all connected—one big human family—and when we recognize that truth, we treat each other differently. What if every class in school, work group, or congregation found their family connections to each other? What if before every political race and sporting event, the opponents found out how they were related before the opening debate, kick-off, tip-off or face-off? Certainly, the likelihood of treating each other with greater love and respect would increase dramatically.